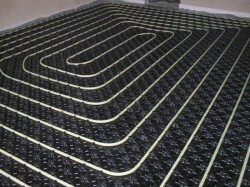 In this type of heating; basically floor radiant heat is generated through the electric cables that are attached with a slab in either floor or walls. Nowadays, there is progress seen in almost every field of life. We all strive towards making our life luxurious and comfortable by bringing best accessories for us. One of the major aspects that are considered a must for ensuring the comfort of a home is the installation of a viable heating system. Today, Floor heating systems have become an obvious choice for houses as well as offices; and people prefer to get a feasible in floor heating system installed at their place, during the construction phase. Although there are different types of under floor heating systems that can installed at a place; but the one that has got most popularity especially for the houses is that of electric in floor heating. The reason for the popularity of this type is very obvious; i.e. easy access to the electricity. Previously, most of the people used to get an electric floor heater for producing warmth in their rooms, but now a whole system has brought ease and comfort for them in the form of radiant heat flooring. The electric in floor heating is preferably used for the smaller setups, because it works most effectively here. In this type of heating; basically floor radiant heat is generated through the electric cables that are attached with a slab in either floor or walls. It is considered best because of its safety as well as ease of installation. Once your room reaches the normal temperature, this radiant floor heating system will go in the maintenance mode, so as to avoid any kind of risks or hazards. It would obviously consume more electricity, and will increase your bills; but then the comfort is worth the cost. So, this is the reason more and more people are going for this type of heating and mostly recommended too.